One can’t help but admire the scale of Tara D’Arquian’s Quests, not only its physical embrace (taking over most of The Borough Hall at Greenwich Dance) and its musical scope (thanks to Bruno Humberto and Philippe Lenzini), but its philosophical sweep. The second part of a trilogy which began with In Situ and is yet to be completed, Quests ‘explores the conflict of identity in contemporary society’ though D’Arquian immediately qualifies this by adding, ‘The conflict…opposes humans’ longing to define themselves to the indefinable character of the self.’ It’s a philosophical argument that borrows from Nietzche’s Three Metamorphoses as a filter through which to approach the issue of identity, but if it structures the thinking behind Quests, it is the ambition and imagination of D’Arquian’s dance theatre that clothes it. The narrative is a ‘fictitious story of a stage director slowly falling into madness after the loss of his wife whilst creating the first piece of the In Situ trilogy.’ This reference to the previous work is where Quests begins in Greenwich Dance’s Minor Hall that Yann Seabra has refurbished as a rose-coloured lounge of an ocean liner. When the audience wanders in to take a seat the performers are already in place, fixed in time, caught in mid-movement at their tables or sitting in their chairs. A bar serves drinks, the noise of chatter and laughter rises around these transfixed characters and a curious little boy walks over to each one to see if they are real. It’s an intriguing start. The playwright (Humberto) and his wife (Typhaine Delaup) are seated at a table on a raised dais in the centre of the room looking into each other’s eyes. The stage is set up for a cabaret show and musicians (Lenzini on guitar, D’Arquian on bass) start to assemble. From their static poses Anne-Gaëlle Thiriot and Marc Stevenson come to life and slowly make their way to the stage. The band starts up and Thiriot delivers a ballad in a rich French voice while dropping flowers distractedly from a bowl. Delaup suddenly jumps up from the table and rushes from the room. Quests has begun in real time. Three veiled beauties waft into the room like muses to inspire Humberto while Ottillie Parfitt as his producer arrives dripping with disdain and drops an envelope of money on the table to get the writer out of his depression and into finishing the new work. Quests is, like Francois Truffaut’s film Day for Night, a play about the making of a play. In this promenade format, D’Arquian pulls apart the story to put it back together again, sets us loose to explore aspects of the narrative and gives us enigmatic clues along the way that only deepen the mystery. We shuffle through Stevenson’s room, a suicidal bathroom, a noxious vision of Eden in the lobby where Humberto chases his spirited wife out of the theatre into a taxi and back, on through a passage with a pram spattered in blood, a room where one of the muses plays piano and bodies lie under a dinner table of dirty dishes, up the stairs with walls pasted with notes and envelopes, and finally into the main hall where the two aspects of the story collide in symbolism of epic proportions. Paradoxically the means by which D’Arquian achieves all this are flimsy; it is theatre-by-the-seat-of-your-pants in which the richness of its soaring imagination is in conflict with the naivety of its materials. The struggle of this latter part of Quests is how to make our imagination surmount the means. The contrast in scale between the performers — extended to a cast of almost 30 — and the giant muslin tent that covers most of the Hall is redolent of a religious ceremony and the plainsong chant (and Geneviève Giron’s bright white light) raises the ritual theatre to a contemplative level. But the dispersed action in this large space lacks sufficient tension to keep our focus from wandering to the manipulation of the fabric. There are episodes that overcome this, as when two performers desperately try to communicate while their handlers at opposite corners let them out slowly towards each other on the end of ropes. When Humberto raises his voice, the ropes are let go and the two fall into an embrace. Or when Humberto is playing the white piano like a crazed genius and the three muses interrupt him; while two drag him away a third seamlessly takes over playing his score. But it is the setting of the final duet with Stevenson and Thiriot that gets close to bringing all the elements together and to suggesting the scale D’Arquian has in mind. 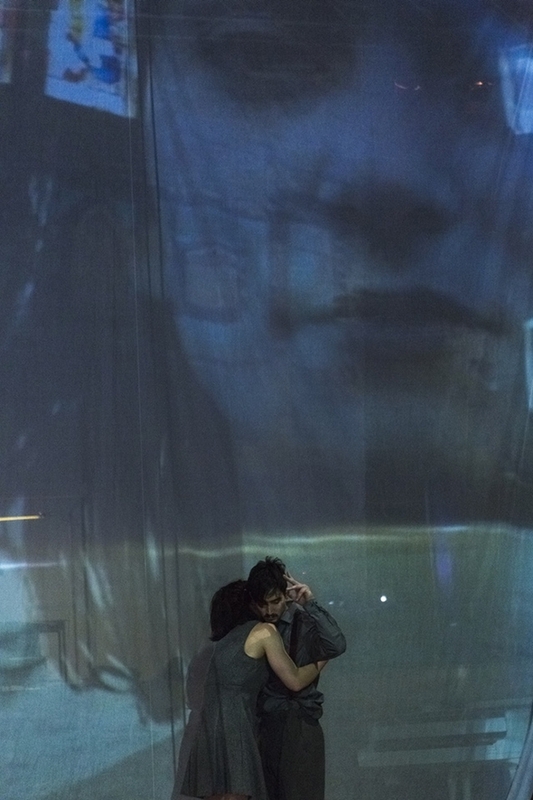 Using the muslin as a screen for projecting images of In Situ, placing the extended chorus singing a ritual chant behind the (now seated) audience, summoning the author and the producer to resolve the story (the play is a huge success but Humberto is leaving to start a band), and introducing a funeral procession with a coffin outlined in rope, the choreography is a catalyst of resolution in its contrast of sinuous and angular, torso and extremities, and distance and contact. All that remains is a grand anthem of a song while an electric fan in the background sends those mountains of script floating into the air.